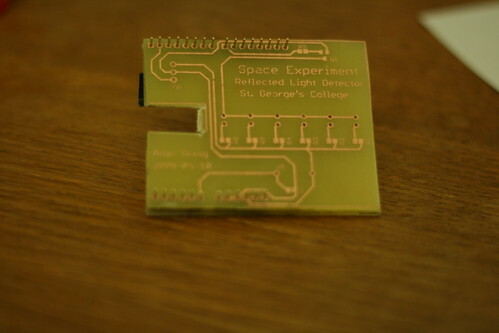 So I created a PCB for the Space Experiment mockup. 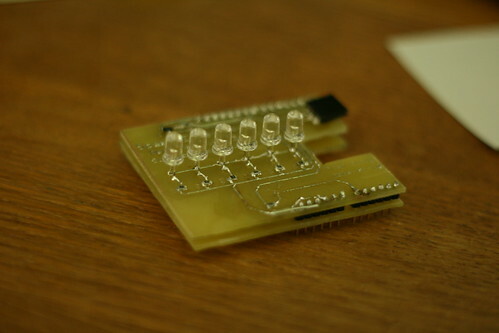 It's functionally identical to the breadboarded version but is its own PCB, looks a lot better and has some text on it. It actually took three tries to get it right. The first time, it all worked nicely and I etched it perfectly, only to realise I'd messed up the design! I'm making the PCB as a shield for an Arduino, so it plugs into the top. I had the layout fine and was initially assuming I'd have the copper on the bottom (since the LEDs have to be on top), but later decided I wanted the copper on top. I quickly did a change layer to top for everything, without realising that I'd left the text mirrored! What printed, if made properly, should have resulted in mirrored text on top. 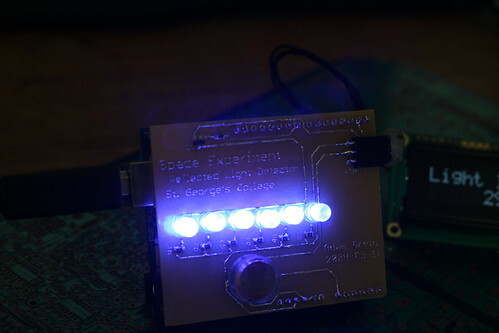 Instead I made it so the text was readable - which means the copper had to go on the bottom for it to connect to the Arduino! The next revision fixed this but was overetched and would have taken a whole load of fixing up, which is a pity. Finally, I had it all perfect! All the text is really readable, I have a right angle socket for the LCD connector, and it all worked first time. Lovely! 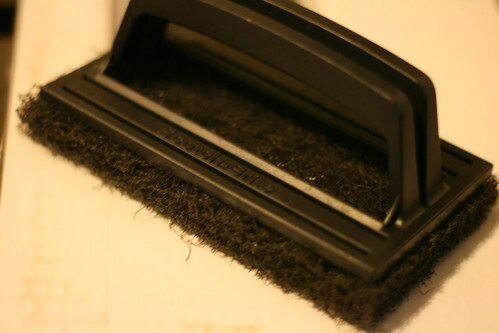 This awesome plastic scourer thing has a nice, easy to use handle and really really tough plastic bristles, which are absolutely ideal for PCBs. 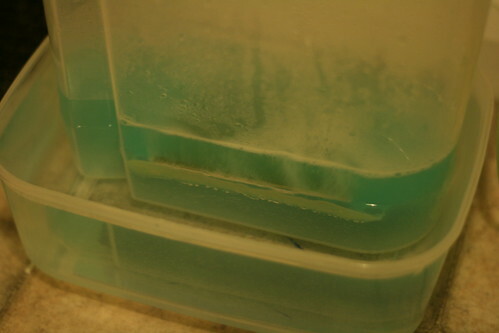 Not only can I clean them at the start (and get the copper really nicely scratched up too), but it also strips the toner off like no one's business. It's taken about twenty minutes out of the process, especially when the transfer didn't work and I have to take the toner off. This was also the first PCB made with my new laser printer, which absolutely rocks - for PCBs, I print at 1200dpi, extra toner, high contrast, onto transparency, from the manual feed tray. I've set it up so I can just select the "Samsung_ML2510_PCB" printer on the list and all those options are used, so it's just a case of hitting print and it does it. All the PCBs transferred really, really well with it! 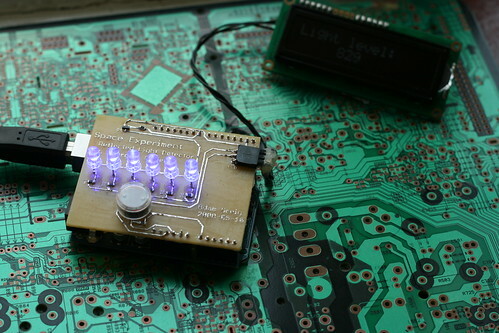 I can definitely recommend the Samsung ML-2510 mono laser for making PCBs at home.